Do you want Botox but you’re afraid of ‘frozen-face’? An experienced injector knows how much and where to treat to get an optimal outcome. Injecting is an art. Choose an ‘artist’ carefully. Ask how long they have been practicing, examples of work (before and after photos) and even for references. A great injector will have raving fans who are happy to sing the praises of great work. There are more options than ‘just Botox’. 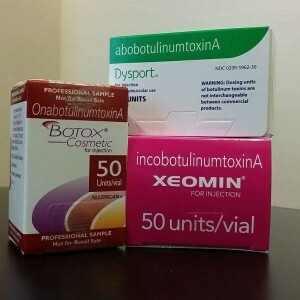 Botox, Dysport, and Xeomin are all basically interchangeable. Each brand has a slightly different formulation of the same substance, Botulinum Toxin A, but they all work the same way: they block the nerve impulses of the injected muscles to temporarily relax muscle movements that cause wrinkles. Injectors will debate the minor differences in result, so once again, choose an experienced injector that will share the differences and help you decide which one is right for you. Any toxin injection you choose is temporary. Depending on the person and lifestyle, it lasts an average of 3 to 4 months. So if you ultimately are not happy with the result, it won’t last forever. Plan your first experience with plenty of time before a big event. Perhaps 6 months before your wedding would make more sense than 2 weeks before the big day. After all, you likely will not get a brand-new hair stylist or chose an aggressive new style before a big event, so time accordingly and there will be less stress.